Today I went out to my garden. 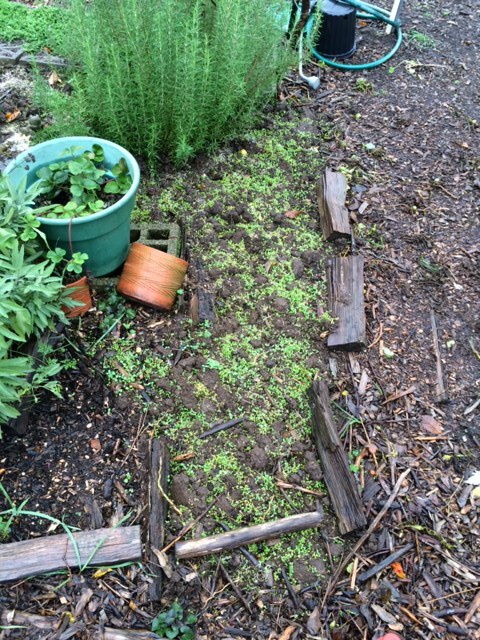 I took out the tomato and green pepper plants last week, turned the soil and dropped clover seeds on the bare ground. After a week of rain the clover is beginning to sprout. I’ve done a lot of work on my ten foot square plot over the last three years, and I’m happy with my ongoing experiment. I’m not a very knowledgeable gardener but I do manage to get enough tomatoes and green peppers each year to put up a healthy fund of spaghetti sauce. This year was different. I had knee problems in the spring and couldn’t do the physical work to maintain and plant the garden. Yet, we have an agreement at Kailash Ecovillage to do certain work on our individual plots or we have to give our garden up to someone else. I didn’t want to give it up so I put out a call to my little cohousing community for help. The short description of what followed is that I found a family that wanted a garden plot but had to wait until next year for one to open. I put up the money and the plot, and they did almost all of the labor. In return they got to try out gardening and had most of the food for their family, while I got to keep my plot for another year. That agreement ended last week when I, with my now healed knee, took over maintenance of the plot, and they were assigned a plot of their own for 2015. This is one of the small ways in which we have community here at Kailash Ecovillage. People share or exchange work, food or stuff, and it helps to make us a nicer place to live. In truth, my little plot wasn’t just the product of my own labor at the start. I got it when I moved from the south to the north side of the building three years ago after the death of my dear friend, Richard Ludt. I wanted to be on the north side and the first floor at some point, and moving to his unit was a way to honor him by maintaining the plants and tea house he created. 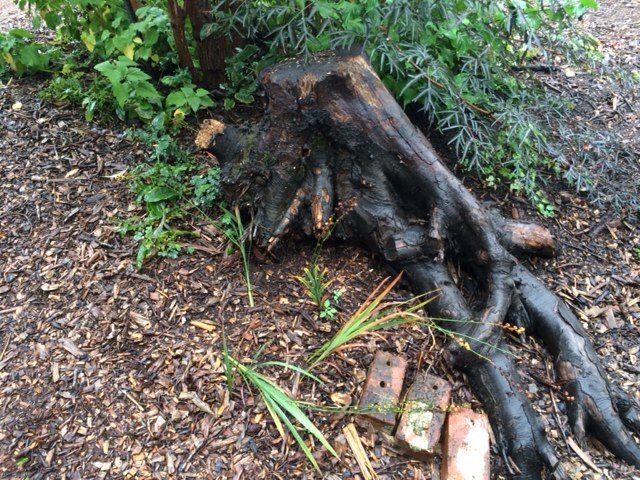 When I first got it, the plot had a tree stump in the southwest corner. I started digging around it and quickly realized that it would be a difficult job for my then 67 year old body. I put out an email and asked for help, and one person in particular came through the most. His name is Doug, and he recently moved due to changing life circumstances. He’s a quiet sort of guy, young, late twenties I would guess, and committed to having meditation in his life. He took on that stump as a project and did most of the work in digging it out. He then moved it to the east, and this year it was deposited where another resident, Vince, an artist, sculptor and builder, had cleared out some unruly plants near my doorway. Doug also initiated morning meditations and kept a meditation garden of sand that he periodically raked into different patterns. I watched him a couple of times, and clearly this was a form of meditation for him. Kailash is a melange of human types and we have both long timers and people who are here for a year or so before moving on. That’s part of the intention of Kailash, and each person leaving may be a loss for those who knew them best. Doug’s presence will be here for a while, though. 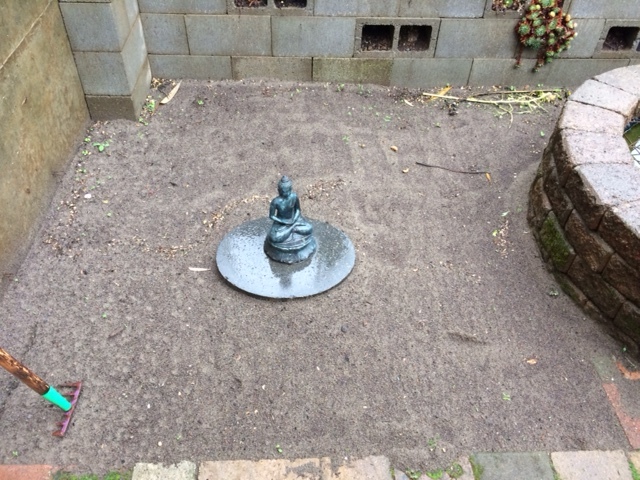 My garden still has some of his energy in it, the stump looks like it will stay for a while, and the meditation garden is being taken on by someone else. As I walked out this morning to take those pictures the soft rain reminded me of the coming of another fall and winter. Things are dying out and new things will come in the spring. And some things, like the earth, a tiny portion of which is the canvas upon which I paint my garden, will be here longest of all. The newly planted clover after 1 week and a good bit of rain.